A set of APIs that allows developers to develop sensor device drivers within a common framework and enables application developers to develop applications that can access sensor data from any Mynewt sensor device using a common interface. Support for onboard and off-board sensors. An OIC sensor server that exposes sensors as OIC resources and handles OIC CoAP requests for the sensor resources. A developer can easily develop a MyNewt OIC sensor enabled application that serves sensor resource requests from OIC client applications. A sensor shell command and optional sensor device driver shell commands to view sensor data and manage sensor device settings for testing and debugging sensor enabled applications and sensor device drivers. The package name for the sensor device driver is <sensorname>. All functions and data structures that the sensor device driver exports are prefixed with <sensorname>. The <SENSORNAME>_CLI syscfg setting defined in the device driver package to specify whether to enable the sensor device shell command. The <SENSORNAME>_ONB syscfg setting defined in the BSP to specify whether the onboard sensor is enabled. The <SENSORNAME>_OFB syscfg setting defined in the sensor creator package to specify whether to enable the off-board sensor. The following Mynewt packages provide sensor support and are needed to build a sensor enabled application. 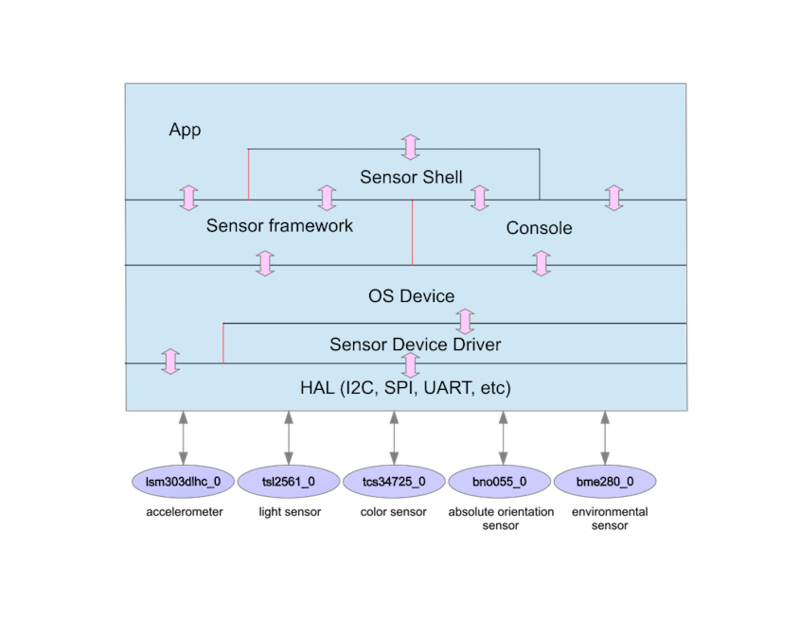 hw/sensor: The sensor framework package. This package implements the sensor framework APIs, the OIC sensor server, and the sensor shell command. hw/sensor/creator: The sensor creator package. This package supports off-board sensor devices. It creates the OS devices for the sensor devices that are enabled in an application and configures the sensor devices with default values. See the Creating and Configuring a Sensor Device page for more information. Note: This package is only needed if you are building an application with off-board sensors enabled. hw/bsp/: The BSP for boards that support onboard sensors. The BSP creates the OS devices for the onboard sensors that the board supports and configures the sensors with default values. See the Creating and Configuring a Sensor Device page for more information. hw/drivers/sensors/*: These are the sensor device driver packages. The hw/drivers/sensors/<sensorname> package is the device driver for a sensor named SENSORNAME. See the Sensor Device Driver page for more information.